THE SMALL number of tornadoes that hit southern New England each year are usually so weak that they go unnoticed by residents and undetected by meteorologists. So it’s no surprise that communities in Western and Central Massachusetts, where tornado warnings are far more frequent that actual tornadoes, were caught off guard by the deadly twisters that ripped through several towns this Wednesday, killing four people and injuring some 200 others. While it will take the hardest hit communities of Springfield and Monson months, if not years, to recover from the damage, the toll was not as devastating as it could have been. Credit goes to the Southern New England Forecast Office — the local branch of the National Oceanic Atmospheric Administration — and local law enforcement officials throughout the Commonwealth. Thanks to the speedy warnings issued over NOAA’s vast emergency radio network, local officials were able to send precise alerts to communities anywhere near the path of the most violent storms. Media outlets played an instrumental role in spreading the warnings. Those advance alerts most likely saved lives on the streets of Springfield, where police officers risked their own personal safety to patrol the streets with megaphones, ordering people to shelter. 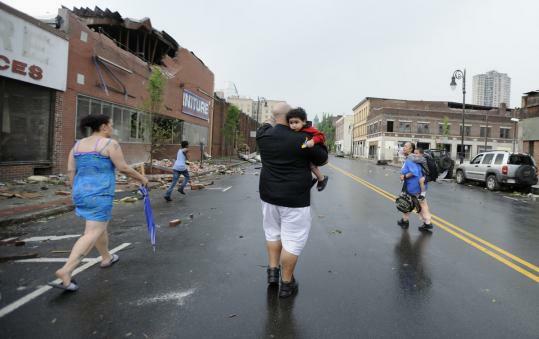 And when another tornado touched town in the central Massachusetts town of Monson later in the afternoon, residents there had had almost an hour of advance warning. These days, state and federal agencies are investing large sums to develop sophisticated ways to prepare for and respond to emergencies like natural disasters and terrorist attacks. But investing in basic education and preparedness can be just as vital. Our own natural disaster this week proved that it’s sometimes the most simple and old fashioned techniques, like radio communication and brave law enforcement officials on the ground, that can save lives during times of crisis.